We are living in a world telling us to be busy all the time. We are told to fill our calendars leaving no time for ourselves. We feel like we are being lazy if we aren’t being productive all the time. It’s like that saying about putting on your oxygen mask first, you must take care of yourself in order to take care of others. 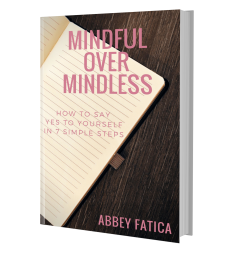 In Mindful Over Mindless, Abbey shares her seven simple steps to put yourself back on your priority list and how she finds time every day to take time for herself even as a mom of four. If you are wanting more patience, clarity, ease, focus and simplicity in your life, then grab your copy today! Grab it for Free when you get updates sent straight to you !